Air Quality in Bangkok screams for escapes to healthier locations rare to find during these days. 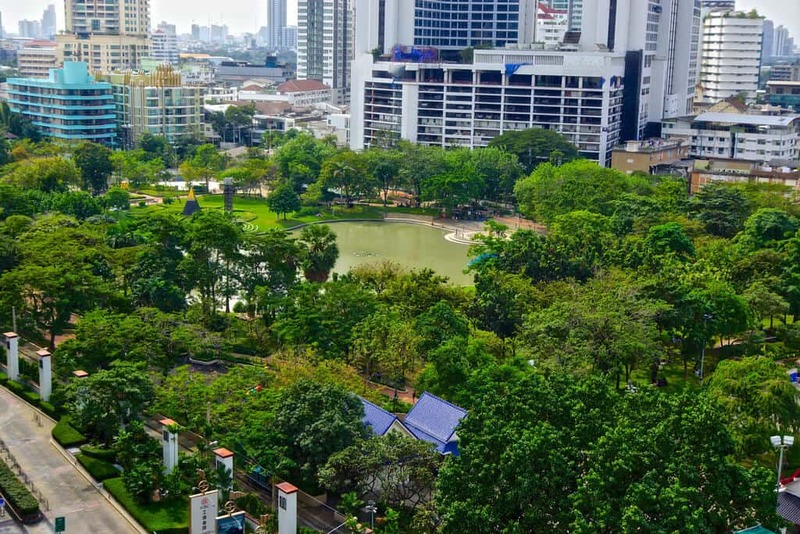 Why not escape to the best inner-city parks in Bangkok? The Air Quality in Bangkok worsens. Small Escapes from the Bangkok polluted air asks to avoid high-traffic areas. Therefore, an escape to the best inner-city parks in Bangkok might breathe in some better air quality. Check here the worst affected areas of pollution in Bangkok. Bangkok, a city that instantly recalls images of skyscrapers, shopping malls, streets lined with food vendors and traffic jams that wrap around every Soi. BTS queues, shops, motorbikes, tourists, busy office workers, tuk-tuks and the hustle and bustle of a city that is still hard not to love. But occasionally, like anywhere, a city escape from the crowds, traffic and the hustle and bustle is well needed. Especially, as the ‘Bangkok air quality brings some of the highest and most toxic pollution levels, the capital has ever seen. 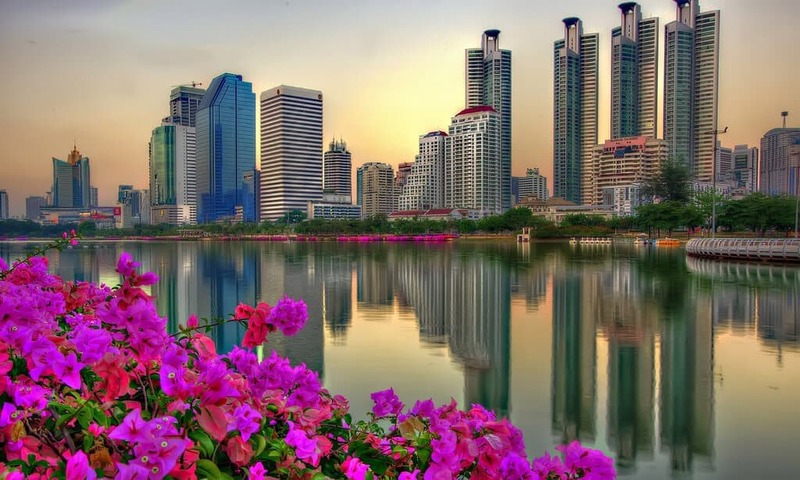 Luckily for Bangkokians, the city also hosts a beautiful selection of inner-city parks and green spaces, providing the perfect escape from crowds, traffic and that ever-problematic Bangkok air quality. Bangkok Air Quality at King Rama IX Park Is Better Than in the City. An Expansive Space and a Must For Garden Lovers. Occupying several hundreds of green acres, Suan Luang Rama IX is the largest park in Bangkok City. The stunning park was built for the 60th birthday of King Bhumibol and was created back in 1987, much to the delight of the Bangkok residents needing a city escape. The vast, open space is full of fresh air and filled with picturesque pavilions, greenery, flowering gardens, exercises tracks and a large central lake. The gardens are a well-favoured attraction to King Rama IX Park, with a collection of international themed areas spanning across the park. A large Chinese garden has an occupying temple, the French garden features impressive sculptures with, and the Italian garden boasts a collection of fountains. Instagrammers can often be found crowded around the American garden that features a striking geo-dome with growing cacti. Exercise lovers can enjoy the bicycle, and jogging tracks within the park and a trip here promises a quiet and tranquil escape from city crowds. Benchasiri is a locals favourite and also compact in size compared to its better-known park neighbours. A perfectly convenient all-rounder, Benchasiri packs all the features needed for a park day and a perfect escape from the crowds and rising Bangkok smog. Exercise tracks, lakes and a stunning wide-angle fountain are all available and is popular with family outings at the weekend, due to its smaller size and a significant number of amenities, Benchasiri is known as Bangkok’s ‘boutique’ park. Kiosks for food and a basketball court are very popular at Benchasiri, as are the children’s playgrounds and skatepark. The highlight of Benchasiri is most definitely the fascinating array of Thai sculptures that can be found scattered around the park area. Bangkok Air Quality at Lumphini Park Is The Runners’ Paradise, but still very much Polluted. The first public park of Bangkok and probably the most well-known, Lumphini is famous for the integrated running track. Alongside fresh air and plenty of shelter from warm weather, the park also features a large open lake and plenty of areas for various activities. Still offering a peaceful escape from the city, Lumphini tends to be a bit livelier than other resident Bangkok parks. Many people around the expansive park area can be found sharing food, playing games, celebrating social occasions and enjoying family gatherings with music. The park is an exercise haven and is hugely popular for active residents who can often be found running, walking, doing Tai Chi, partaking in exercise classes, as well as using the ever-popular outdoor gym. The park also has an integrated library and a vast lake area, housing a collection of paddles and rowing boats that are all available for hire. Benjakitti is a lot smaller than the parks as mentioned earlier but packs fresh air and a hugely picturesque area into a compact space. A well organised and large cycle path wraps around a calm central lake and houses a separate running and walking path to avoid any biking obstructions or accidents. Beautiful areas of the garden and flowered areas can be found scattered around the park, and it also features a well-equipped outdoor gym. A small skatepark is hugely popular at this park, and it is an excellent place for parents who are giving children their first cycling lessons. Those without their own bikes can hire bicycles from the park, costing just 40 baht for an hour. Swan paddle boats are also available to rent at Benjakitti Park, making a perfect day out and escape from the busy city, all just a stone’s throw from the central Asok BTS station.